Just last week I was setting up IP cameras at home and connecting the irrigation controller to the network and I was opening my network up to the internet WAY too much. (I was port forwarding all kinds of ports.) So to mitigate opening up to the internet so much I decided to set up a VPN tunnel that I could easily connect to which would allow me access to my local network. In a nutshell, instead of opening numerous ports on my router for every device I wanted remote access from, I opened up 1 singular port for the VPN and used OpenVPN software on my phone to connect back. Once connected it behaves as if I was at home and connected locally. 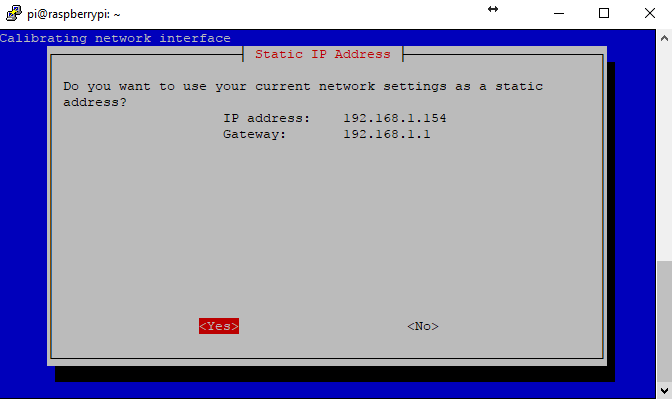 This post will go through the basics of setting up a simple VPN server on a cheap raspberry pi. This example uses the older RPi 2, which is more than sufficient for accessing a few IP cameras and other devices remotely. PREREQUISITE SETUP - Because we need to get ourselves ready! The first step is to prepare the SD card for the PI. A 4 or 8Gb SD card will be suitable for the PiVPN installation. 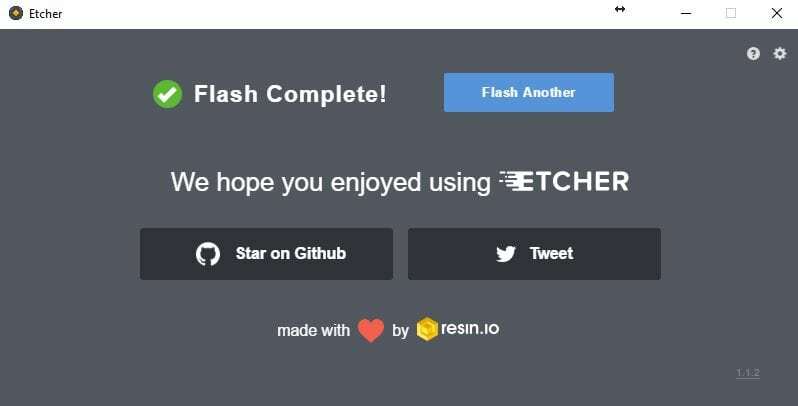 You will first need to download the latest Raspian Lite image (We do not require the GUI for PiVPN) and a copy of Etcher. 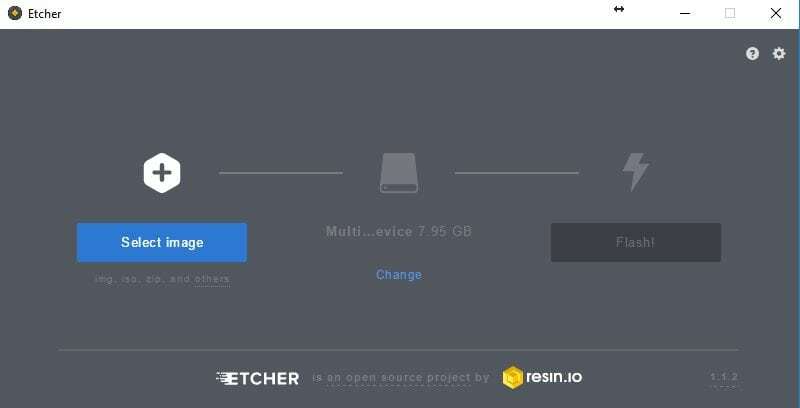 Etcher will allow you to install and prepare your SD card. It is super easy to use. Select Image > Select SD card (Make sure you select Correct Drive) > Click Flash. 2. Select the correct drive you want to install the image on. Be sure it is the correct drive as all data will be formatted first. 3. Select Flash – You may get a windows prompt to elevate permissions to administrator. 4. 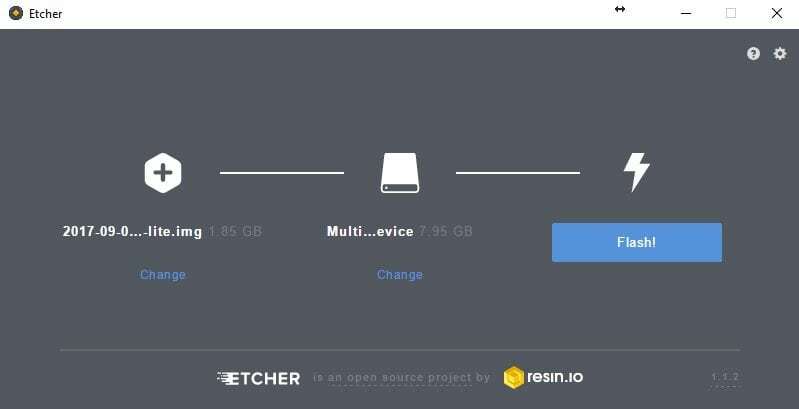 Assuming no errors were found, you can now take the SD card and insert it into the Pi. We have chosen to run the Lite version of Raspbian because we do not require the additional overheads of the GUI. The VPN server will sit hidden away and we will connect to is via SSH if we need to. The problem is that SSH is not enabled by default. Thus we require the HDMI cable, a monitor and keyboard to change this first. Viewing the Pi via the HDMI cable and using the connected keyboard and mouse in a PITA, This is why we are setting up SSH, so we can go back to our computer and do all the configuration from the comfort of our home PC. We need this IP address so that we can log into the Pi via SSH. Look for eth0 and browse across until you see ‘inet’ This is the IP address we require. In this case the Pi IP address is: 192.168.1.154 – Write this down or remember it. 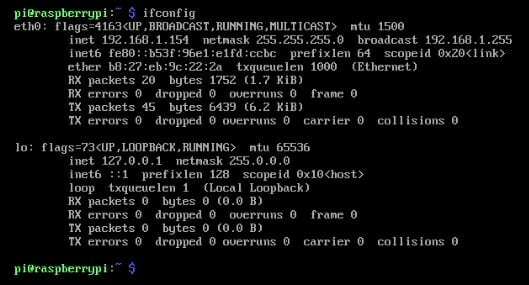 Enter the IP address of the Pi from the ‘ifconfig’ command. Then Click OPEN. You may be asked to accept some authentication keys. You only need to do this once. You will now be greeted with a similar login screen to previous. If you find that some of your keyboard strokes are not the same as mine, you may need to go back into Raspi-Config and change the localization settings or Keyboard options. 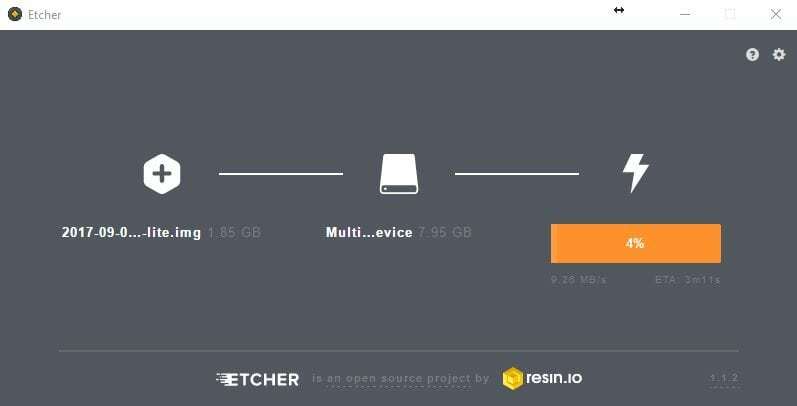 It also can not hurt to Extend the size of the file system. This will allow the Raspbian build to utilize the full size of the SD card. 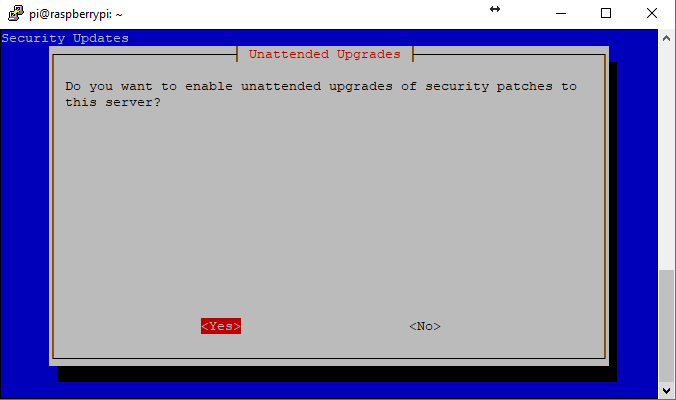 PiVPN INSTALL - Now that we are setup, it's time to install and setup! 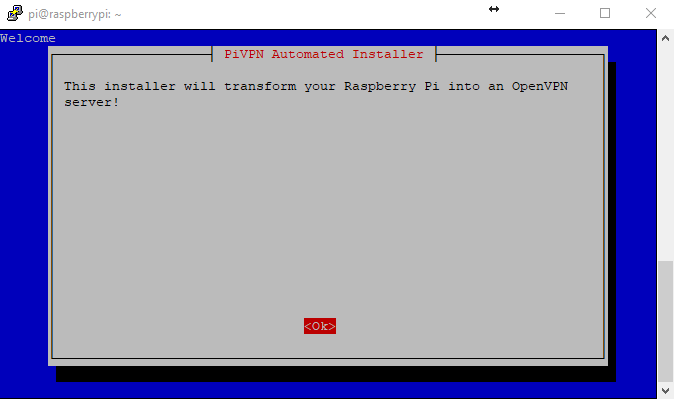 Now to installing PiVPN. 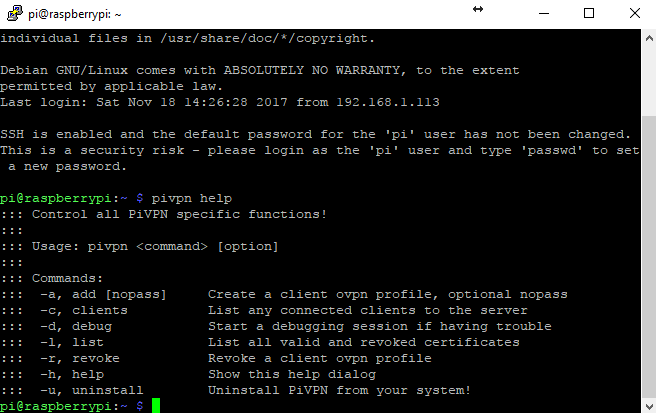 If you are looking at installing PiVPN, then you have probably already been to the website. I just want to make mention that installing software like this could be dangerous if it is not from a trusted source. Basically we are telling the pi to run a heap of commands that are located on the internet. Be sure to check the source first to ensure it is reputable. 2. At this stage you should be thinking about making the address the Pi was given static. Or logging into your router and “binding” the DCHP address it was given to the MAC address of the Pi. This will allow the Pi to hold the lease and never change. 3. This will change the address. Remembering when it commits the change, your SSH session will drop and you will have to re-establish the session on the new IP address. For now I am going to leave it as 192.168.1.154 as I have bound that IP to the MAC of the Pi on my router. 4. 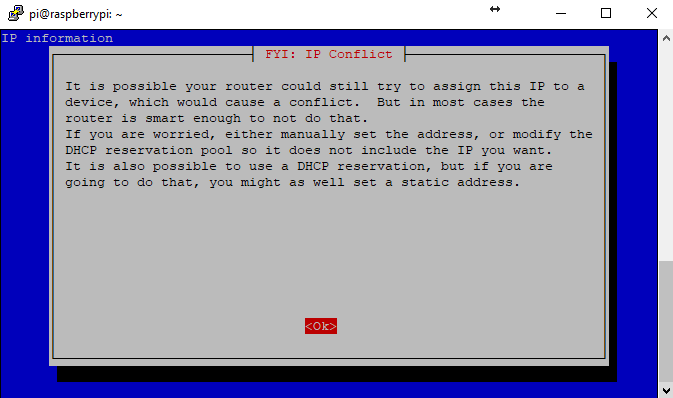 Indicating that you could get IP conflicts if you dont either bind your IP to MAC or exclude that IP from DHCP. 5. 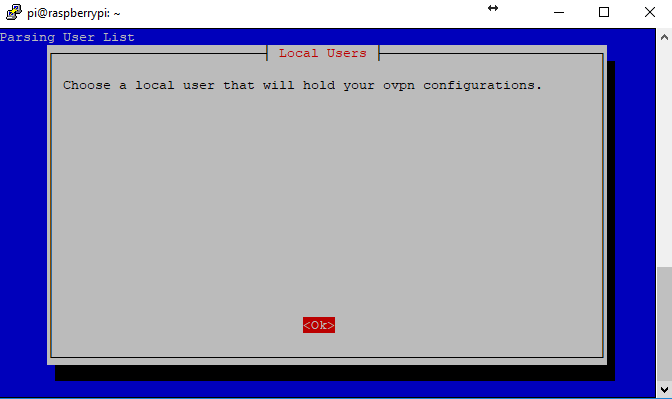 This screen is asking you to choose a user to hold your ovpn configs. 6. If you had other users setup then you would be able to select them here. It is generally good practice to Change the users away from the default username and password. For now we will stick with the default. 7. Because this is our only open facing port, we really should keep all software up to date including security patches. Why not do this automatically? Unless you have some configs that you don’t want messed with. Automatic patches can have a tendency to mess with the compatibility of software at times. 8. As per the last screen. Do it! or make sure you keep on top of it manually. 9. 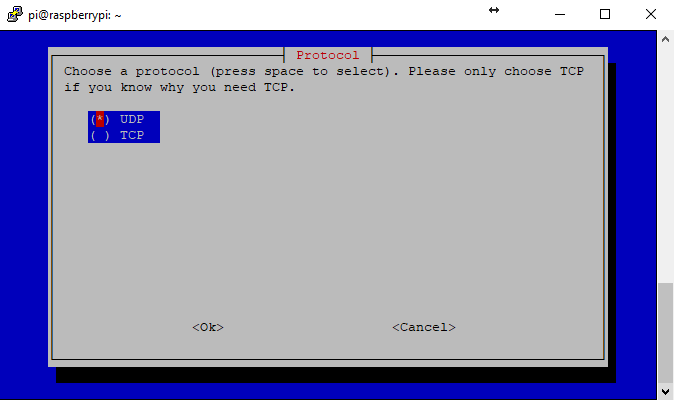 UDP will suffice unless you have any additional configs that require TCP. 10. If you don’t want anyone sniffing your VPN out on the default port, feel free to change this default port. 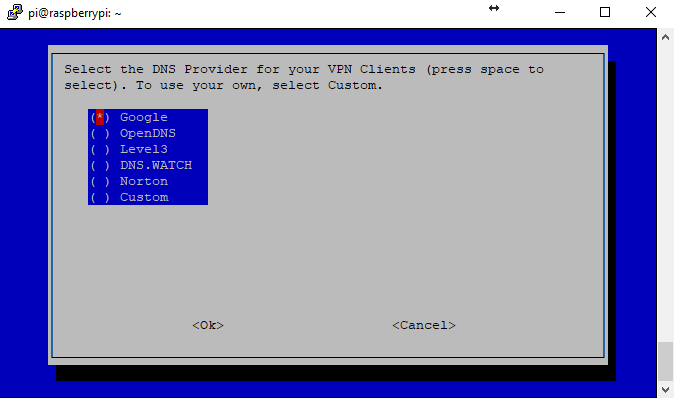 However be sure to port forward the new one on your router so that the VPN can be accessed from outside your network. 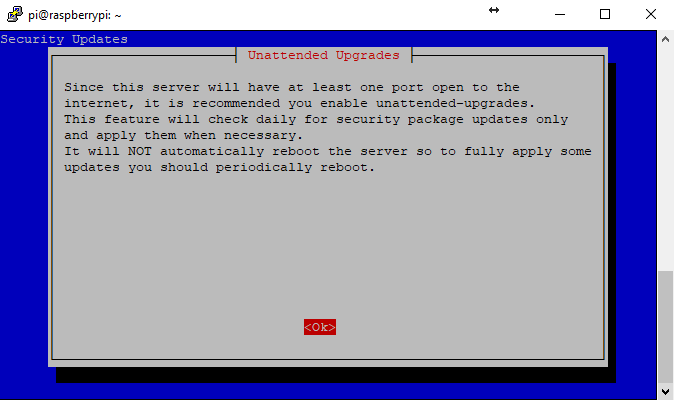 Also remember this port for any config changes that may need to be made. 12. 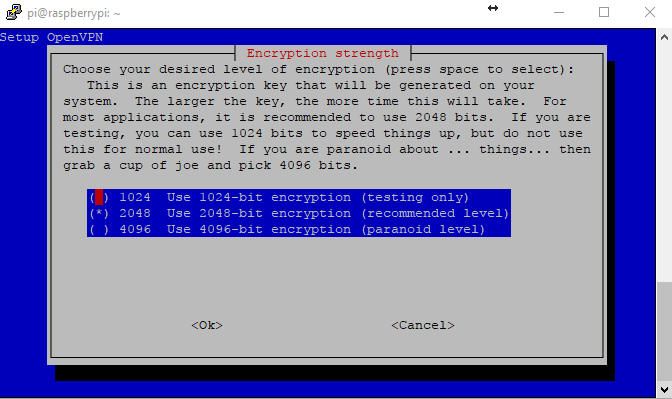 Choose the encryption type for your server. 2048bit encryption will suffice in most instances. 13. 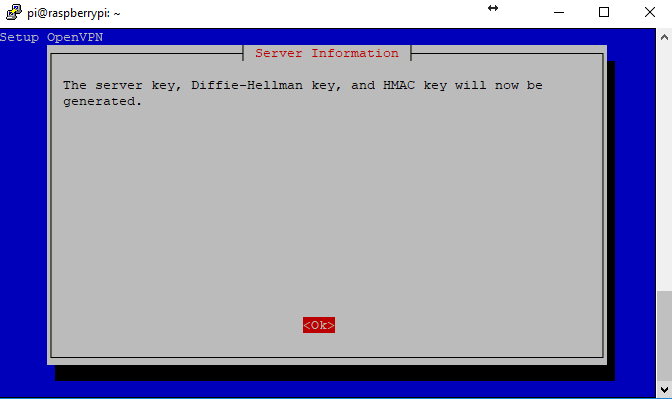 The This screen if indicating the types of keys that will now be generated. 14. Because the Pi has very little processing power it can take 30-45 minutes for it to create the 2048 bit certificate/key. Go get a coffee! If you had of chose 4096 encryption then you would get the option to download some assistance files from the internet. Otherwise generating a 4096bit key on a Pi would take a VERY long time. 18. 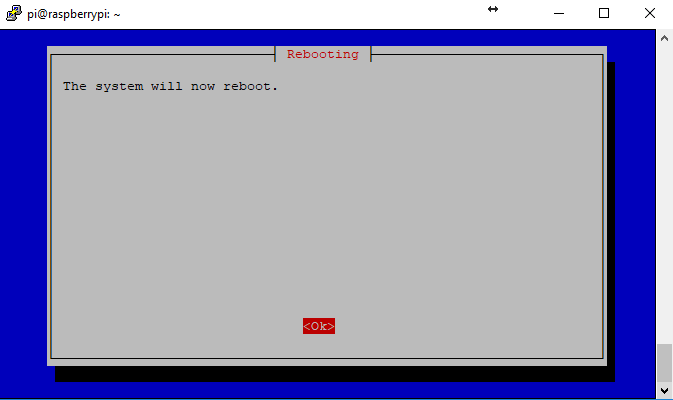 Everyone loves a good reboot! No time like the present. 19. Just in case you were not sure from the previous screen. Remembering that your SSH session will drop during the reboot. 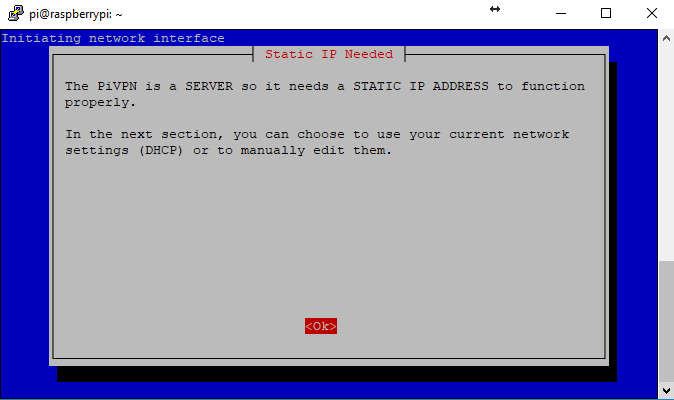 Simply Re-connect to the same IP address after a few minutes. 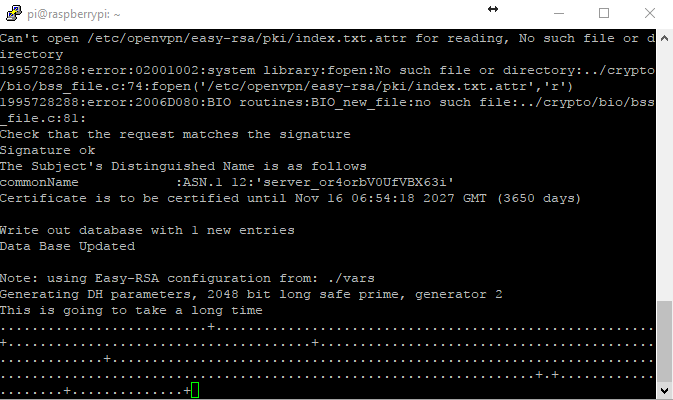 This is one of those administration tasks that should be done regularly to keep the Pi image in good working order. Unless obviously you are against keeping software up to date, or you have something specific happening in which you cannot afford for it to be affected by updates. We now need to configure the server to accept connections from the client devices or computers. 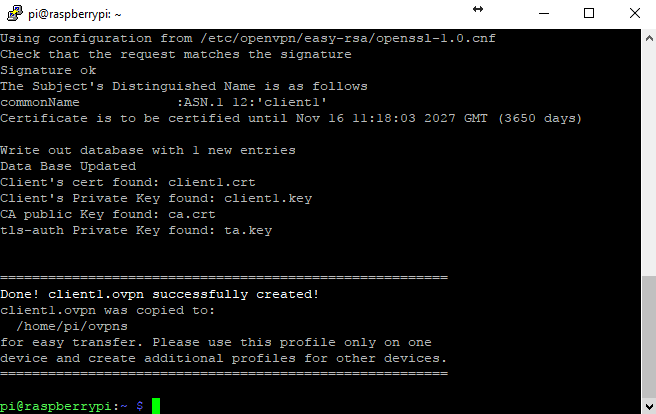 To do this we setup a client openvpn configuration file. 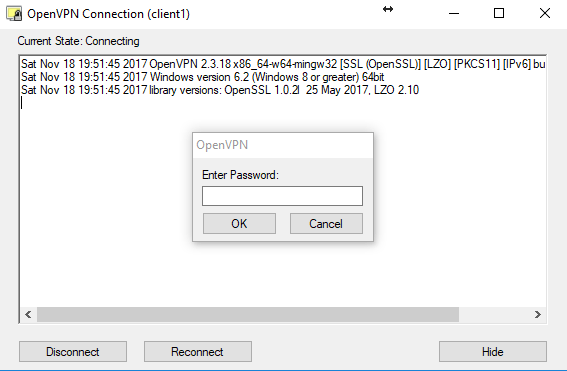 (.opvn file to be exact) This client file is loaded onto the device that wants to connect to the VPN tunnel. It stores the config and encryption keys to access the VPN. 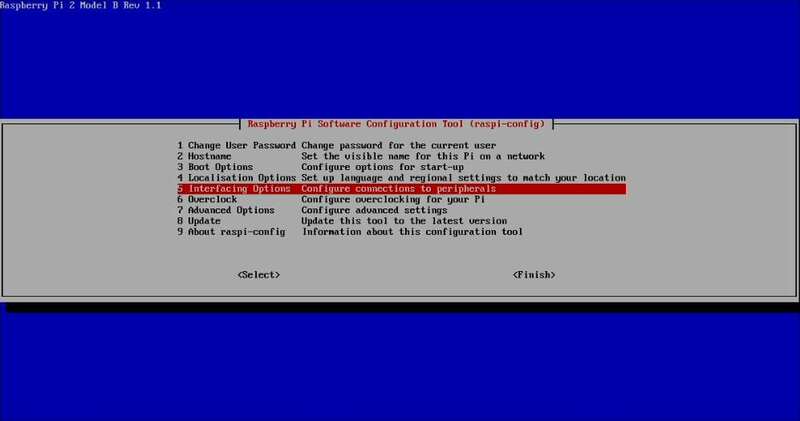 You will be greeted with the list of commands that we can now run on the Pi to configure the clients and do other administration tasks. This will start the process of creating a client configuration file. You will need to set a password at this point. Ensure you do not forget it, as you will be required to add it on the Client VPN software when we try to connect. 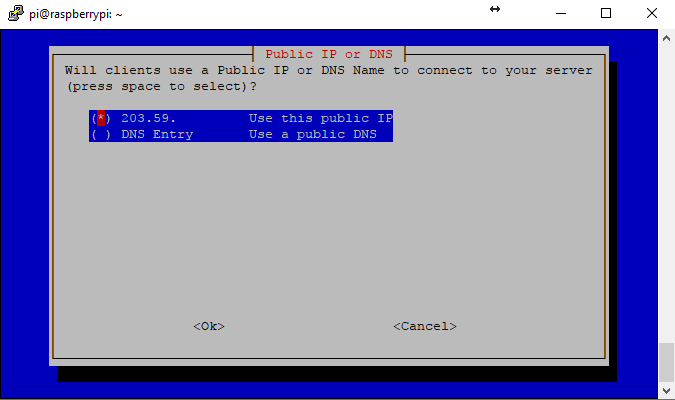 In this example we are going to move the configuration file to a windows PC that we want to be able to access the VPN and the local network. We must now use some of the additional software to move or grab this config we just created. 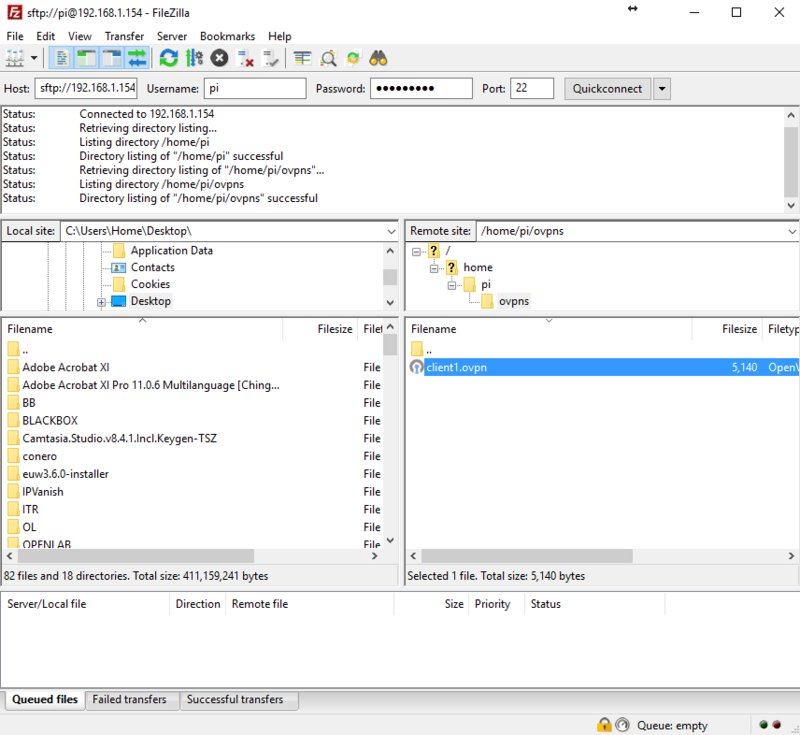 In this case we decided to use Filezilla as the Pi image already has SFTP enabled by default. 2. When you hit “Quickconnect” you should see a successful directory listing in the right hand navigation pane. Navigate your way to the ovpns folder (Located in the Home directory, if for some reason it did not default to that) Then identify the client1.ovpn config file that was created earlier. Download this file to your desktop by clicking on it and dragging it to the left pane. Ensure you identify the area you are dragging it to as that is your local computer. 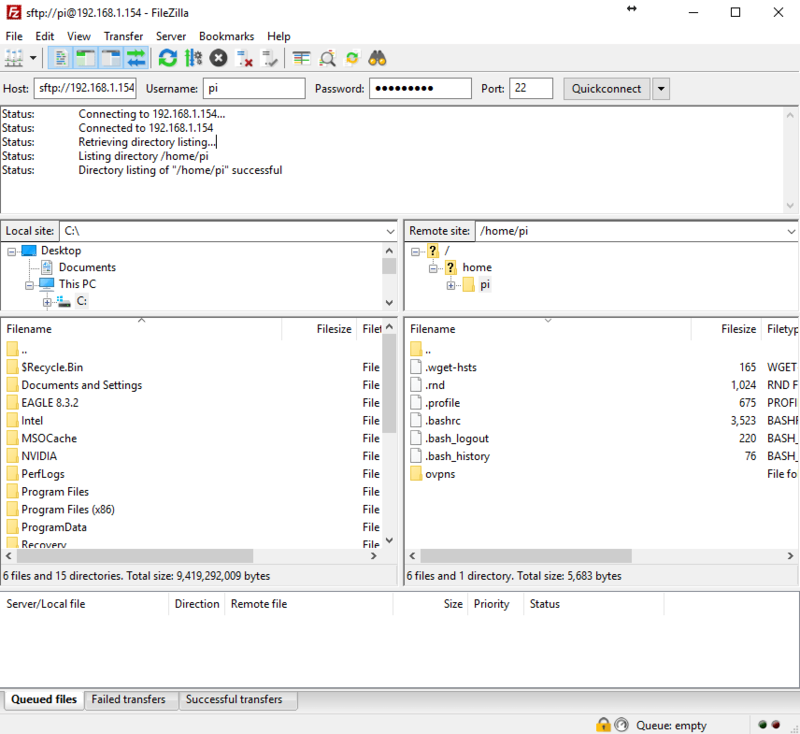 CLIENT CONFIG - We need to setup our client now using that file! 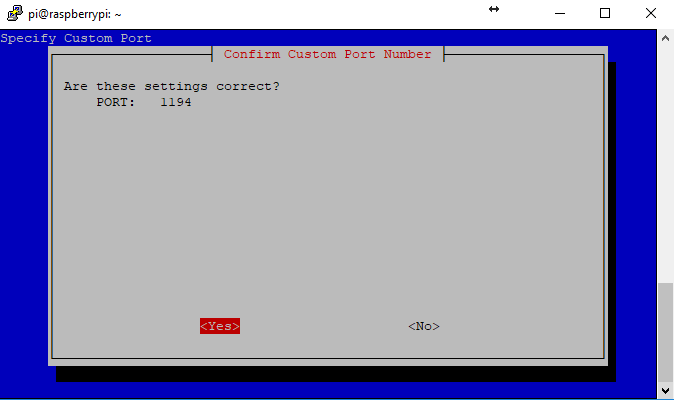 Step through the standard hoops for installing a windows application. 2. 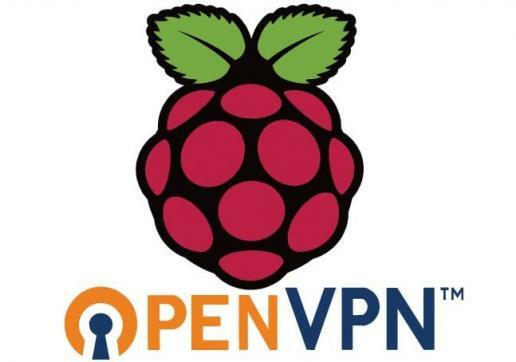 Run the OpenVPN software. 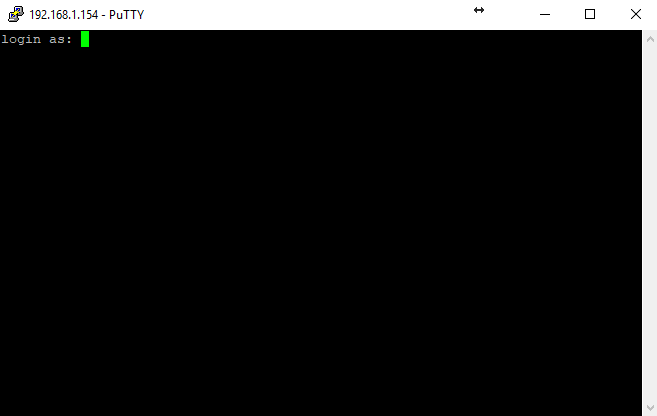 Most likely is will open to your taskbar. 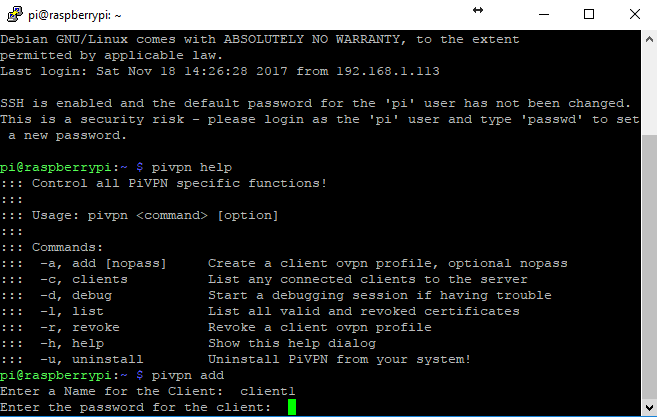 Enter your password that we set when we added the client to the Pi VPN server. 4. Once connected you should see the OpenVPN client taskbar icon turn green and the status screen should look like the above. The VPN server should have setup your routing tables now so that you can access anything inside your local network automatically. Give it a shot, shoot a ping through to your local router. What you may also notice is that the VPN tunnel has been assigned a 10.0.8.# address. The VPN server runs its own network for the tunnel with its own DHCP. When another client connects they are allocated another address on this same range. The server looks after the bridging of this network to your own local network.